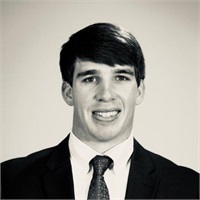 Davis Gill began working as a financial adviser with The Jenkins Group in May of 2018. He was born and raised in Albany and graduated from Deerfield Windsor high school. He attended the University of Georgia and graduated with a degree in Accounting from the J.M. Tull School of Accounting. Since graduation, Davis has passed the CFP® exam and completed the College of Financial Planning Professional Education Course.Davis understands the large amount of responsibility that is involved when advising clients and strives to make the best recommendations in order for clients to pursue their goals in life. When Davis is away from the office, he enjoys attending First Baptist Church of Albany and spending time with family and friends. One of his favorite things to do in his spare time is cheering on the Georgia Bulldogs in Sanford Stadium.